I find Clean & Clear to be hit or miss with my skin, but their Acne Spot Treatment is one of my favorites at clearing a breakout quickly. So when given the chance to test out their routine for clearing pores, I took it. 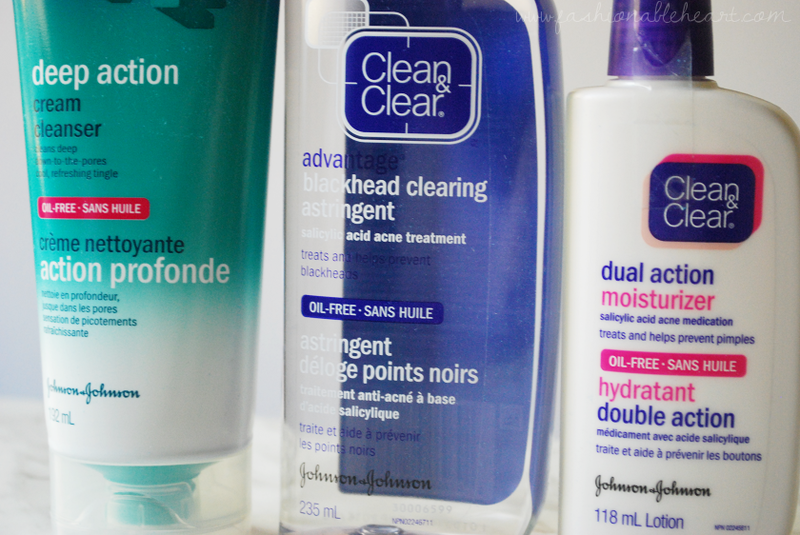 With all of the makeup and such that goes on my skin, I love the promise of a deep cleanse. For me, I chose the pores option not because of breakouts, but because my pores are changing. Description - The Deep Action Cream Cleanser removes dirt, oil, and makeup deep down to the pores. It's oil-free formula won't clog your pores and will leave your skin feeling cool and fresh with the tingle of really clean skin. Directions - With clean hands, splash water on your face and apple a dime-sized amount of the cleanser to your palms. Work it into a lather and apply it to your face, avoiding your eyes. For extra cleansing action, use a washcloth. Rinse face thoroughly and pat dry with a towel. My thoughts - I like this as far as cleaning goes. It's creamy enough that I did not notice it causing my dry skin to become drier. My face does feel a lot cleaner afterward and it removes makeup quite well. It's a bit harsh with my sensitive skin, so I don't think I will continue to use it everyday. I think this would be great for during that "time of the month" when your skin is acting out. And I did notice a slight change on my nose where I have a few blackheads. My skin leans more toward dry, but my nose has a mind of its own. I can see this working well for those with combination skin. Description - The second most important step in clean skin is going after any dirt left in your pores. Tackle any blackheads with the Blackhead Clearing Astringent. It is specially formulated to reach deep into pores and remove dirt and oil, which are the facial impurities that can lead to blackheads, pimples, and acne. Directions - Soak a cotton ball or pad with the astringent and wipe it over your face. The T-zone is usually where oil hangs out, so give that a good once-over. This product can dry out your skin, one time a day is recommended at first. You can increase to two to three times a day, if it is needed or recommended by your doctor. My thoughts - Holy strong astringent, Batman. It's a little too much for me even with once daily use. But again, my nose has a mind of its own and did not mind it at all. Since that is where my blackheads have taken up residence, I guess that worked out well for me. I haven't noticed this clearing them up, but I haven't noticed them getting worse either. I wouldn't be against using it on any breakouts to help clear them up faster, but it is too strong for me to use all over my face. Description - The Dual Action Moisturizer is oil-free moisture with a proven acne-fighting ingredient, salicylic acid. It moisturizes dry skin while treating and helping to prevent pimples. The salicylic acid deep cleans pores. Directions - After cleaning your face, this is the finishing touch. Because of the salicylic acid, have a light hand applying. Apply a thin layer over the affected area once a day for a few days. You can build up to two or three times a day, if needed or recommended by your doctor. My thoughts - I like that this says "affected area". It worked pretty well on my T-zone, where my pores cause me the most problems. On other parts of my face, it was strong but not as much as I thought it would be. A thin layer is definitely the way to go. It didn't do too much for my dry and sensitive skin, but it didn't cause an allergic reaction or too much redness either. I did have a pimple on my chin right when I started this routine and it cleared up within two or three days. I don't get pimples that often, but when I do they usually last 5-7 days. My blackheads haven't vanished, but this kept them at bay. At best, I think this routine is great for those with mild breakouts or if you want to spot clean certain areas of your face. I don't feel like this is the perfect fit for me for a daily cleansing routine, but I do believe I'll reach for them when I have a problem area and to attack my blackheads. 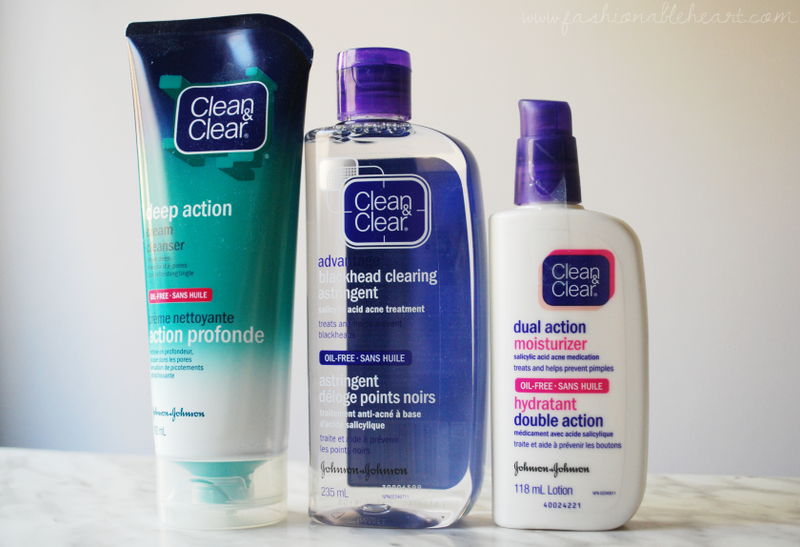 Have you tried Clean & Clear? Does it take you back to your middle school and high school days like it does me? I do love when products give me a sense of nostalgia. Though, I love the new look and bottle shape they have now.